Elvis Aaron Presleya (January 8, 1935 – August 16, 1977) was an American singer and actor. A cultural icon, he is commonly known by the single name Elvis. One of the most popular musicians of the 20th century, he is often referred to as the "King of Rock and Roll" or simply "the King". 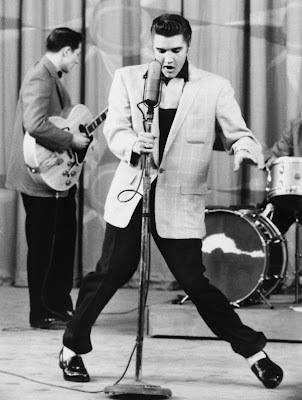 Born in Tupelo, Mississippi, Presley moved to Memphis, Tennessee, with his family at the age of 13. He began his career there in 1954, working with Sun Records owner Sam Phillips, who wanted to bring the sound of African-American music to a wider audience. Accompanied by guitarist Scotty Moore and bassist Bill Black, Presley was the most important popularizer of rockabilly, an uptempo, backbeat-driven fusion of country and rhythm and blues. RCA Victor acquired his contract in a deal arranged by Colonel Tom Parker, who went on to manage the singer for over two decades. Presley's first RCA single, "Heartbreak Hotel", released in January 1956, was a number-one hit. He became the leading figure of the newly popular sound of rock and roll with a series of network television appearances and chart-topping records. His energized interpretations of songs, many from African-American sources, and his uninhibited performance style made him enormously popular—and controversial. In November 1956, he made his film debut in Love Me Tender. Drafted into military service in 1958, Presley relaunched his recording career two years later with some of his most commercially successful work. He staged few concerts however, and guided by Parker, proceeded to devote much of the 1960s to making Hollywood movies and soundtrack albums, most of them critically derided. In 1968, after seven years away from the stage, he returned to live performance in a celebrated comeback television special that led to an extended Las Vegas concert residency and a string of profitable tours. In 1973 Presley staged the first concert broadcast globally via satellite, Aloha from Hawaii. Prescription drug abuse severely deteriorated his health, and he died suddenly in 1977 at the age of 42. Presley is regarded as one of the most important figures of 20th-century popular culture. He had a versatile voice and unusually wide success encompassing many genres, including country, pop ballads, gospel, and blues. He is the best-selling solo artist in the history of popular music. Nominated for 14 competitive Grammys, he won three, and received the Grammy Lifetime Achievement Award at age 36. He has been inducted into multiple music halls of fame. 307 – Jin Huidi, Chinese Emperor of the Jin Dynasty, is poisoned and succeeded by his son Jin Huaidi. 1297 – François Grimaldi, disguised as monk, leads his men to capture the fortress protecting the Rock of Monaco, establishing his family as the rulers of Monaco. 1455 – The Romanus Pontifex is written. 1499 – Louis XII of France marries Anne of Brittany. 1734 – Premiere performance of George Frideric Handel's Ariodante at the Royal Opera House, Covent Garden. 1790 – George Washington delivers the first State of the Union address in New York, New York. 1815 – War of 1812: Battle of New Orleans – Andrew Jackson leads American forces in victory over the British. 1971 – Bowing to international pressure, President of Pakistan Zulfikar Ali Bhutto releases Bengali leader Sheikh Mujibur Rahman from prison, who had been arrested after declaring the independence of Bangladesh. 1977 – Three bombs explode in Moscow, Russia, Soviet Union within 37 minutes, killing seven. The bombings are attributed to an Armenian separatist group. 1979 – The tanker Betelgeuse explodes in Bantry Bay, Ireland. 1982 – The break up of AT&T: AT&T agrees to divest itself of twenty-two subdivisions. 1989 – The Kegworth air disaster. British Midland flight 92 crashes into the M1 motorway killing 47 people out of 127 on board. 1989 – Beginning of Japanese Heisei period. 1996 – An Antonov 32 cargo turboprop powered plane crashes into the central market in Kinshasa, Zaire killing more than 350 people. 2003 – Turkish Airlines Flight 634 crashes near Diyarbakir Airport, Turkey, killing the entire crew and 70 of 75 passengers. 2004 – The RMS Queen Mary 2, the largest passenger ship ever built, is christened by her namesake's granddaughter, Queen Elizabeth II. 2011 – An attempted assassination of Arizona congresswoman Gabrielle Giffords and subsequent shooting in Casas Adobes, Arizona at a Safeway grocery store kills six people and wounds 13, including Giffords.